After a "stormy" week of non-stop economic news, political drama and corporate earnings, the calendar takes a break this week with a lull in market sensitive data and events. The US CPI report is the highlight while Q2 GDP reports in Japan and the UK are also worth a mention. Inflation data will also be out in China while earnings season will start to wind down across the US and Europe. As always, markets will be closely watching the rhetoric out of the US and China as the war of words on trade rumbles on. The highlight of the relatively quiet for data week is the US July CPI report on Friday. As it stands, the current market consensus is for a +0.2% mom headline and core reading, with the latter likely to be enough to keep the annual rate at +2.3% yoy. That consensus reading is the 33rd month in a row that the forecast is +0.2% mom. So far this year we've had four in-line readings, one beat and one miss. Aside from the CPI data we'll also get the July PPI report in the US on Thursday, along with the July monthly budget statement on Friday. The main focus for data in Europe next week is likely to lie with some of the hard data releases. In Germany we got the June factory orders data on Monday (which printed at a 17 month low) followed by June trade and industrial production data on Tuesday. In France we'll also get June industrial production on Friday, while the highlight in the UK will also come on Friday with the preliminary Q2 GDP release (+0.4% qoq expected), and June trade and industrial production data. In Asia there's some data of significance in China with the July trade stats on Wednesday and the July CPI and PPI prints on Thursday. CPI is expected to nudge up one-tenth to +2.0% yoy however PPI is expected to decline two-tenths to +4.5% yoy. In Japan we'll get the preliminary Q2 GDP report on Friday (+0.3% qoq expected) while the BoJ summary of opinions from the July meeting will also be out on Wednesday and will be worth a quick skim given the policy tweaks made at the meeting. Away from the data it's a fairly quiet week for central bank speak with only Richmond Fed President Thomas Barkin due to speak on Wednesday in Virginia. Barkin is a voter on the FOMC this year and is generally seen as centrist in his views. 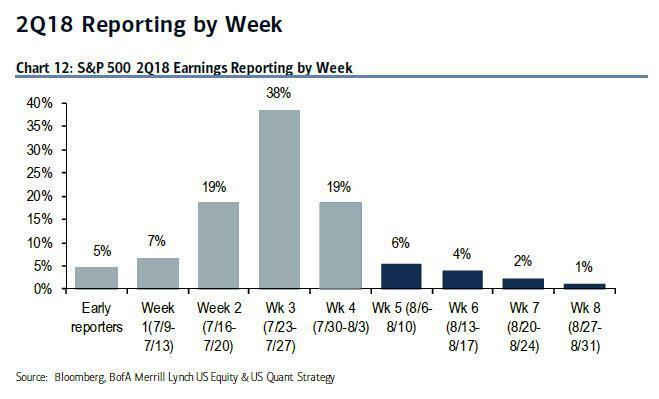 Meanwhile earnings will start to slow down a bit next week with just 44 S&P 500 companies due to report. Walt Disney (Tuesday) and CVS Health (Wednesday) are the highlights in the US while outside of that we have HSBC, SoftBank and UniCredit on Monday, Glencore on Wednesday, Merck and Adidas on Thursday and Gazprom on Friday. Other things to note next week include the first phase of the restoration of US economic sanctions on Iran taking effect from Monday. Central Bank meetings are also due in Australia and Argentina on Tuesday, Thailand and New Zealand on Wednesday, and Peru on Friday. The consensus is for policy to stay on hold at all meetings. Monday: It's a quiet start to the week for data on Monday. In Europe, we get June factory orders and the July construction PMI for Germany along with July new car registrations for the UK and the August Sentix investor confidence survey reading for the Eurozone. There is nothing of note in the US, while in China the Q2 current account balance reading will be out at some stage. It's worth noting that the first phase of the restoration of US economic sanctions on Iran are also scheduled to take effect from Monday. HSBC, SoftBank and UniCredit are all due to release earnings. Tuesday: The overnight data on Tuesday includes the July BRC like-for-like sales reading in the UK and June household spending and labor earnings data in Japan. In Europe we'll get the June trade balance, current account balance and industrial production data for Germany along with the June trade balance and current account balance data for France. House price data for the UK for July will also be out. In the US the June JOLTS job openings and consumer credit data are due out. China's July foreign reserves data is also scheduled to be released at some stage. Walt Disney will also release earnings. Wednesday: Overnight on Wednesday we get the BoJ's summary of opinions along with Japan's June current account balance and July trade balance data. In Europe, the only release is France's July Bank of France industry sentiment index while in the US we get the latest weekly MBA mortgage applications data. China's July trade data will also be released at some stage during the day. Away from the data, the Fed's Barkin is scheduled to speak while CVS Health and Glencore are due to report earnings. Thursday: The early focus on Thursday will be China's July PPI and CPI prints. With nothing of note in Europe, attention will turn to the US where we get the July PPI report along with final June wholesale inventories data and the latest weekly initial jobless claims data. Merck and Adidas will also report earnings. Friday: It's a busy end to the week for data on Friday. 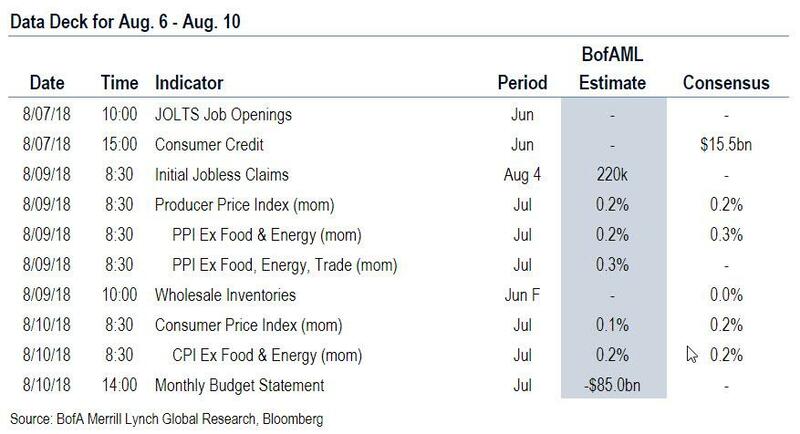 The main highlight is likely to be the July CPI report in the US in the afternoon. Prior to that we get the preliminary Q2 GDP reports in Japan and the UK. June industrial production data is also due out in France and the UK as well as June trade data in the latter. In the evening we'll also get the July monthly budget statement in the US. Japan Post and Gazprom will report earnings. Finally, focusing just on the US, Goldman writes that the key economic release this week is the CPI on Friday. There is one scheduled speaking engagement by a Fed official this week, by Richmond Fed President Thomas Barkin on Wednesday. 02:00 PM Senior Loan Officer Opinion Survey, 2018Q3: We expect that the Fed will release results and a memo from its quarterly Senior Loan Officer Opinion Survey on bank lending practices. The 2018Q2 release showed a modest easing in standards and terms for C&I loans in the first quarter of this year, while standards for CRE loans were unchanged, with most banks citing weaker demand. Since the last survey, US bank loan growth has increased slightly, growing at just above a 5% annualized pace in Q2. 08:45 AM Richmond Fed President Thomas Barkin (FOMC voter) speaks: Richmond Fed President Thomas Barkin will speak in Roanoke, Virginia on “Unlocking our Potential.” Audience and press Q&A is expected. 08:30 AM Initial jobless claims, week ended August 4 (GS 220k, consensus 220k, last 218k): Continuing jobless claims, week ended July 28 (consensus 1,735k, last 1,724k): We estimate initial jobless claims rose by 2k to 220k in the week ended August 4, following a 1k increase in the previous week. The trend in initial jobless claims appears to still be declining, but we expect a potential modest increase this week due to the timing of auto plant shutdowns. 08:30 AM PPI final demand, July (GS +0.2%, consensus +0.2%, last +0.3%); PPI ex-food and energy, July (GS +0.2%, consensus +0.3%, last +0.3%); PPI ex-food, energy, and trade, July (GS +0.2%, consensus 0.2%, last +0.3%): We estimate a 0.2% increase in headline PPI in July, reflecting firmer core prices, as well as higher food and energy prices. We expect a 0.2% increase in both core measures of PPI, reflecting a tick down from the June increase based on slightly softer recent price indicators that tend to lead PPI. We do not expect a meaningful impact on prices from the tariffs that went into effect in early July. 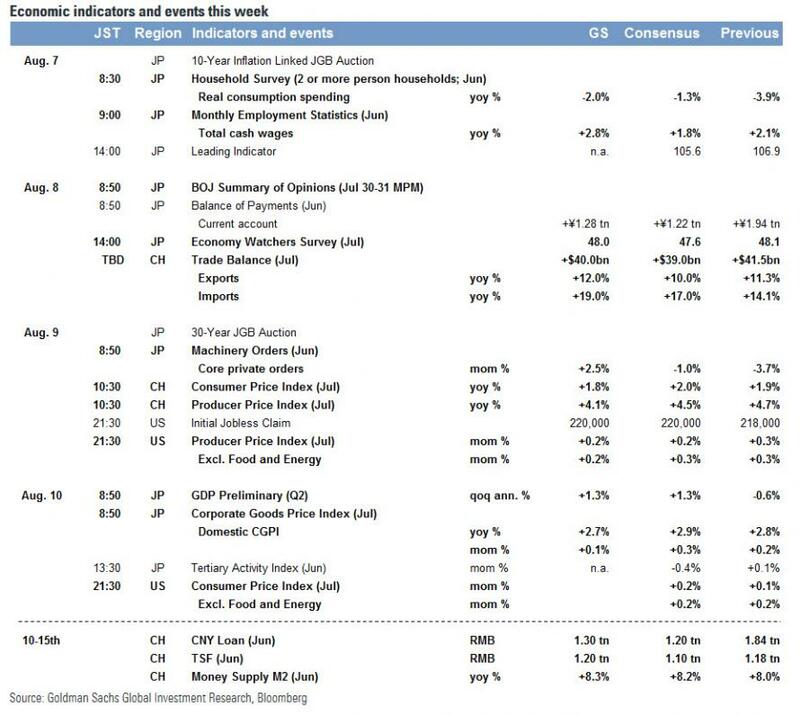 08:30 AM CPI (mom), July (GS +0.15%, consensus +0.2%, last +0.1%); Core CPI (mom), July (GS +0.19%, consensus +0.2%, last +0.2%); CPI (yoy), July (GS +2.94%, consensus +2.9%, last +2.9%); Core CPI (yoy), July (GS +2.30%, consensus +2.3%, last +2.3%): We estimate a 0.19% increase in July core CPI (mom sa), which would leave the year-over-year rate stable at +2.3%. Our forecast reflects modest increases in apparel and used car prices but weakness in the lodging category. We also expect a pause in medical care commodities inflation, reflecting recently announced prescription-drug price freezes. We also expect a trend-like gain in the shelter category, as alternative rent growth measures have softened but imputed utility costs should support the owners' equivalent rent category. We do not expect a significant boost from the tariffs on $34bn of Chinese goods (enacted in early July), reflecting their incidence (industrial inputs and capital goods as opposed to consumer products). We look for a 0.15% increase in headline CPI (mom sa), reflecting a modest drag from energy prices.